I would like to respond to comments made on 12 Sep 2012 by “stegor”. First, let me say that I have been using this facility several times a year since 1971. In the early days for tent camping (1971 – 1981), cabins from 1989 – 1998 and via RV from 1999 to present. Regarding the food service… glad you visited when there was some! There is no food service during winter months… that’s why the cabins have full cooking facilities. When I first started using the SAFB Annex there were few cabins. The facility enjoyed sold out crowds AND appropriated funds. In a few years they built the cabins and sold out every weekend and most summer week days. Fast forward to about 1990. The cabins were getting old and needed a lot of repair. Two new “model” cabins were built with plans to replace all of the cabins over a several year period. Before they started, Congress changed the rules and appropriated funds could no longer be used for MWR. In addition boats, motors and the dock needed to be replaced. The “little store” used to be larger and better stocked and was an official AAFES facility, staffed by an AAFES employee. At this same time the employee retired and AAFES closed the facility. The Annex suddenly found itself without a store, no appropriated funds and a facility that needed lots of work. MWR was going to close the facility but the dedicated workers (many of them retired military) begged the base commander to keep it open for the good of all. The CO agreed, but it had to be fully self sustaining, salaries, repairs, utilities, store, etc. Over the years they’ve managed to keep the place alive. They replaced all outboard motors, repaired the dock and doubled the length. They have survived two floods that raised the lake level 15+ feet above flood stage. They also added about 30 full hookup RV slots. They improved things in the order of what the patrons used the most and what the funds would buy. Fast forward to Hurricane Katrina. FEMA bought more mobile homes than they needed and made an offer to Federal organizations that they could have trailers for just the cost of moving them. The SAFB Annex manager jumped on it, went to New Orleans (at his own cost) and managed to obtain a number of the best never lived in mobile homes FEMA had. The plans were in place to replace each cabin with a mobile home, the first of which was to have been done w/in 30 days of the mobile home delivery. However, some ingrate in New Orleans claimed they were harmed by the formaldehyde used in the construction of EVERY mobile home ever built. They sued FEMA and won. The Annex was ordered not to use the mobile homes until further notice. Hence they’ve sat there wasting away for a bunch of years. Last I talked to the manager (about Oct 2012) they did get tentative approval to start installing them, but they now have years of neglect to contend with. So bottom line, if you’d like to see more improvements happen faster, you might consider thanking those gals in the office that have worked there for little pay for 20 + years to make your stay as enjoyable a possible. You also might consider donating a little something extra to MWR for things the annex needs. 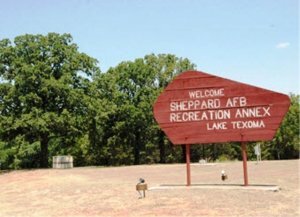 BTW Ft. Sill just across the river in Oklahoma used to have an annex on Possum Kingdom Lake, Tx. They weren’t so lucky, that annex is closed. I personally will continue to use this facility as long as I am able and I will continue to thank all FamCamp / MWR personnel for the job they do. They do better than I could.